NEW YORK — Thrill seekers looking for the ultimate rocket ride may soon turn that dream into a reality aboard a new suborbital spaceship, a winged rocket plane slated to start launching space tourists from California and a tiny Caribbean island by 2014. The Mojave, Calif.-based XCOR Aerospace is developing the suborbital Lynx space plane to carry paying passengers to the upper reaches of the atmosphere, to altitudes up to and exceeding 62 miles (100 kilometers). XCOR is aiming to begin operational Lynx flights from California's Mojave Spaceport in 2013 and from the Dutch-controlled island of Curacao in the Caribbean a year later, said Andrew Nelson, XCOR's chief operating officer. XCOR officials unveiled their launch targets Thursday (June 7) during a news briefing here to announce a new partnership with Space Expedition Corporation (SXC, formerly Space Expedition Curacao), a Netherlands-based space tourism firm that will now act as the sales agent for future Lynx flights. The swanky event was held at the Park Avenue Armory, where artist Tom Sachs is currently showcasing his "Space Program: Mars" art installation on Manhattan's Upper East Side. "Today, we are at the dawn of a new space age," Nelson told an audience that included officials from Curacao and the Mojave Spaceport, and Michael Lopez-Alegria, a former NASA astronaut and the current president of the Commercial Spaceflight Federation. "The old ways of government-designed space exploration are slowly drifting away, and a new commercial space industry is being born right before you." XCOR's two-seat Lynx space plane is designed to carry one pilot and one passenger, making it an intimate and extremely personal journey, he added. The reusable vehicle will be capable of flying up to four flights per day, and is able to take off and land on a conventional airport runway. "Ladies and gentlemen, the saying 'the sky is the limit' is something of the past," said Abdul Nasser El Hakim, Curacao's Minister of Economic Development. "In Curacao, we say 'the space is the limit.'" Watchmaker Luminox also recently announced a partnership with SXC to provide special timepieces for the firm's space tourists. The watches are being developed to withstand the G-forces that will be encountered during the flight. A ride aboard Lynx will retail at $95,000, company officials said, which includes the cost of pre-flight training sessions to prepare passengers for the experience. While this may seem like a steep ticket price, it is still cheaper than the company's competitors, such as Virgin Galactic's $200,000 price tag for a seat aboard its SpaceShipTwo suborbital rocket plane. Virgin Galactic is expected to carry out a series of critical tests later this year and could begin flying paying customers by the end of 2013, company officials have said. By providing lower cost suborbital flights, XCOR and SXC are hoping to make commercial spaceflight more accessible to the public, said Michiel Mol, CEO of Space Expedition Corporation. 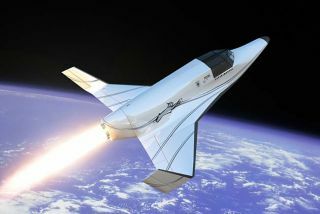 XCOR and SXC together have taken over 175 reservations from clients eager to launch aboard the Lynx spacecraft. "It's becoming available to all," Nelson of XCOR said. "Space, in a certain era, was something you saw and you were amazed [by], but perhaps you didn't feel like you were really going to be the one to participate in. But now, we can transfer ourselves into the faces and the names and the sights that we're seeing develop in front of us. I think it's going to revolutionize the way we view space, the way we approach space, the way we create new industries." And as the development of commercial suborbital and orbital vehicles continues at an aggressive pace, the possibilities for this burgeoning private industry are limitless, said Rick Searfoss, a former NASA astronaut and space shuttle commander, and XCOR's chief test pilot. "The world, in general, doesn't realize how quickly it will be upon us," Searfoss said. "We just don't know — we cannot imagine what this might lead to. Who knows where we might go, where we might be 20 to 30 years from now?"